This article is about the optical phenomenon. For the magnetic phenomenon, see Rayleigh law. For the stochastic distribution, see Rayleigh distribution. For the wireless multipath propagation model, see Rayleigh fading. Rayleigh scattering (pronounced /ˈreɪli/ RAY-lee), named after the British physicist Lord Rayleigh (John William Strutt), is the predominantly elastic scattering of light or other electromagnetic radiation by particles much smaller than the wavelength of the radiation. Rayleigh scattering does not change the state of material and is, hence, a parametric process. The particles may be individual atoms or molecules. 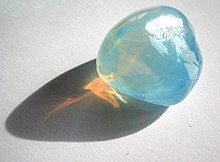 It can occur when light travels through transparent solids and liquids, and is most prominently seen in gases. Rayleigh scattering results from the electric polarizability of the particles. The oscillating electric field of a light wave acts on the charges within a particle, causing them to move at the same frequency. The particle therefore becomes a small radiating dipole whose radiation we see as scattered light. This radiation is an integral part of the photon and no excitation or deexcitation occurs. In 1859, while attempting to determine whether any contaminants remained in the purified air he used for infrared experiments, John Tyndall discovered that bright light scattering off nanoscopic particulates was faintly blue-tinted. He conjectured that a similar scattering of sunlight gave the sky its blue hue, but he could not explain the preference for blue light, nor could atmospheric dust explain the intensity of the sky's color. In 1871, Lord Rayleigh published two papers on the color and polarization of skylight to quantify Tyndall's effect in water droplets in terms of the tiny particulates' volumes and refractive indices. In 1881 with the benefit of James Clerk Maxwell's 1865 proof of the electromagnetic nature of light, he showed that his equations followed from electromagnetism. In 1899, he showed that they applied to individual molecules, with terms containing particulate volumes and refractive indices replaced with terms for molecular polarizability. The fraction of light scattered by a group of scattering particles is the number of particles per unit volume N times the cross-section. For example, the major constituent of the atmosphere, nitrogen, has a Rayleigh cross section of 6969509999999999999♠5.1×10−31 m2 at a wavelength of 532 nm (green light). This means that at atmospheric pressure, where there are about 7025200000000000000♠2×1025 molecules per cubic meter, about a fraction 10−5 of the light will be scattered for every meter of travel. The strong wavelength dependence of the scattering (~λ−4) means that shorter (blue) wavelengths are scattered more strongly than longer (red) wavelengths. Figure showing the greater proportion of blue light scattered by the atmosphere relative to red light. The strong wavelength dependence of the scattering (~λ−4) means that shorter (blue) wavelengths are scattered more strongly than longer (red) wavelengths. This results in the indirect blue light coming from all regions of the sky. 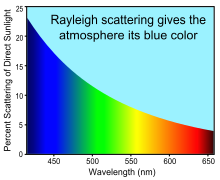 Rayleigh scattering is a good approximation of the manner in which light scattering occurs within various media for which scattering particles have a small size (parameter). A portion of the beam of light coming from the sun scatters off molecules of gas and other small particles in the atmosphere. Here, Rayleigh scattering primarily occurs through sunlight's interaction with randomly located air molecules. It is this scattered light that gives the surrounding sky its brightness and its color. As previously stated, Rayleigh scattering is inversely proportional to the fourth power of wavelength, so that shorter wavelength violet and blue light will scatter more than the longer wavelengths (yellow and especially red light). However, the Sun, like any star, has its own spectrum and so I0 in the scattering formula above is not constant but falls away in the violet. In addition the oxygen in the Earth's atmosphere absorbs wavelengths at the edge of the ultra-violet region of the spectrum. The resulting color, which appears like a pale blue, actually is a mixture of all the scattered colors, mainly blue and green. Conversely, glancing toward the sun, the colors that were not scattered away — the longer wavelengths such as red and yellow light — are directly visible, giving the sun itself a slightly yellowish hue. Viewed from space, however, the sky is black and the sun is white. The reddening of the sun is intensified when it is near the horizon because the light being received directly from it must pass through more of the atmosphere. The effect is further increased because the sunlight must pass through a greater proportion of the atmosphere nearer the earth's surface, where it is denser. This removes a significant proportion of the shorter wavelength (blue) and medium wavelength (green) light from the direct path to the observer. The remaining unscattered light is therefore mostly of longer wavelengths and appears more red. Some of the scattering can also be from sulfate particles. For years after large Plinian eruptions, the blue cast of the sky is notably brightened by the persistent sulfate load of the stratospheric gases. Some works of the artist J. M. W. Turner may owe their vivid red colours to the eruption of Mount Tambora in his lifetime. In locations with little light pollution, the moonlit night sky is also blue, because moonlight is reflected sunlight, with a slightly lower color temperature due to the brownish color of the moon. The moonlit sky is not perceived as blue, however, because at low light levels human vision comes mainly from rod cells that do not produce any color perception (Purkinje effect). where n is the refraction index, p is the photoelastic coefficient of the glass, k is the Boltzmann constant, and β is the isothermal compressibility. Tf is a fictive temperature, representing the temperature at which the density fluctuations are "frozen" in the material. Rayleigh-type λ−4 scattering can also be exhibited by porous materials. An example is the strong optical scattering by nanoporous materials. The strong contrast in refractive index between pores and solid parts of sintered alumina results in very strong scattering, with light completely changing direction each five micrometers on average. The λ−4-type scattering is caused by the nanoporous structure (a narrow pore size distribution around ~70 nm) obtained by sintering monodispersive alumina powder. Strutt, J.W (1871). "XV. On the light from the sky, its polarization and colour". The London, Edinburgh, and Dublin Philosophical Magazine and Journal of Science. 41 (271): 107–120. doi:10.1080/14786447108640452. Strutt, J.W (1871). "XXXVI. On the light from the sky, its polarization and colour". The London, Edinburgh, and Dublin Philosophical Magazine and Journal of Science. 41 (273): 274–279. doi:10.1080/14786447108640479. Strutt, J.W (1871). "LVIII. On the scattering of light by small particles". The London, Edinburgh, and Dublin Philosophical Magazine and Journal of Science. 41 (275): 447–454. doi:10.1080/14786447108640507. Rayleigh, Lord (1881). "X. On the electromagnetic theory of light". The London, Edinburgh, and Dublin Philosophical Magazine and Journal of Science. 12 (73): 81–101. doi:10.1080/14786448108627074. Rayleigh, Lord (1899). "XXXIV. On the transmission of light through an atmosphere containing small particles in suspension, and on the origin of the blue of the sky". The London, Edinburgh, and Dublin Philosophical Magazine and Journal of Science. 47 (287): 375–384. doi:10.1080/14786449908621276. ^ Lord Rayleigh (John Strutt) refined his theory of scattering in a series of papers; see Works. ^ Young, Andrew T (1981). "Rayleigh scattering". Applied Optics. 20 (4): 533–5. Bibcode:1981ApOpt..20..533Y. doi:10.1364/AO.20.000533. PMID 20309152. ^ Conocimiento, Ventana al (2018-08-01). "John Tyndall, the Man who Explained Why the Sky is Blue". OpenMind. Retrieved 2019-03-31. ^ Strutt, Hon. J.W. (1871). "On the light from the sky, its polarization and colour". The London, Edinburgh, and Dublin Philosophical Magazine and Journal of Science. 41 (271): 107–120. doi:10.1080/14786447108640452. ^ Strutt, Hon. J.W. (13 May 2009). "On the light from the sky, its polarization and colour". The London, Edinburgh, and Dublin Philosophical Magazine and Journal of Science. 41 (273): 274–279. doi:10.1080/14786447108640479. ^ Strutt, Hon. J.W. (13 May 2009). "On the scattering of light by small particles". The London, Edinburgh, and Dublin Philosophical Magazine and Journal of Science. 41 (275): 447–454. doi:10.1080/14786447108640507. ^ Rayleigh, Lord (1881). "On the electromagnetic theory of light". The London, Edinburgh, and Dublin Philosophical Magazine and Journal of Science. 12 (73): 81–101. doi:10.1080/14786448108627074. ^ Rayleigh, Lord (1899). "On the transmission of light through an atmosphere containing small particles in suspension, and on the origin of the blue of the sky". The London, Edinburgh, and Dublin Philosophical Magazine and Journal of Science. 47 (287): 375–384. doi:10.1080/14786449908621276. ^ a b "Cornell lectures" (PDF). Retrieved 2 April 2014. ^ Blue Sky and Rayleigh Scattering. Hyperphysics.phy-astr.gsu.edu. Retrieved on 2018-08-06. ^ Barnett, C.E. (1942). "Some application of wavelength turbidimetry in the infrared". J. Phys. Chem. 46 (1): 69–75. doi:10.1021/j150415a009. ^ Cox, A.J. (2002). "An experiment to measure Mie and Rayleigh total scattering cross sections". American Journal of Physics. 70 (6): 620. Bibcode:2002AmJPh..70..620C. doi:10.1119/1.1466815. ^ Sneep, Maarten; Ubachs, Wim (2005). "Direct measurement of the Rayleigh scattering cross section in various gases". Journal of Quantitative Spectroscopy and Radiative Transfer. 92 (3): 293–310. Bibcode:2005JQSRT..92..293S. doi:10.1016/j.jqsrt.2004.07.025. ^ Rayleigh scattering. Hyperphysics.phy-astr.gsu.edu. Retrieved on 2018-08-06. ^ McQuarrie, Donald A. (Donald Allan) (2000). Statistical mechanics. Sausalito, Calif.: University Science Books. p. 62. ISBN 1891389157. OCLC 43370175. ^ Blue & red | Causes of Color. Webexhibits.org. Retrieved on 2018-08-06. ^ Svensson, Tomas; Shen, Zhijian (2010). "Laser spectroscopy of gas confined in nanoporous materials" (PDF). Applied Physics Letters. 96 (2): 021107. arXiv:0907.5092. Bibcode:2010ApPhL..96b1107S. doi:10.1063/1.3292210. Wikimedia Commons has media related to Atmospheric Rayleigh scattering. Ditchburn, R.W. (1963). Light (2nd ed.). London: Blackie & Sons. pp. 582–585. ISBN 978-0-12-218101-6. Chakraborti, Sayan (September 2007). "Verification of the Rayleigh scattering cross section". American Journal of Physics. 75 (9): 824–826. arXiv:physics/0702101. Bibcode:2007AmJPh..75..824C. doi:10.1119/1.2752825. Ahrens, C. Donald (1994). Meteorology Today: an introduction to weather, climate, and the environment (5th ed.). St. Paul MN: West Publishing Company. pp. 88–89. ISBN 978-0-314-02779-5. Pedro Lilienfeld, "A Blue Sky History." (2004). Optics and Photonics News. Vol. 15, Issue 6, pp. 32–39. doi:10.1364/OPN.15.6.000032. Gives a brief history of theories of why the sky is blue leading up to Rayleigh's discovery, and a brief description of Rayleigh scattering.